I can't wait to get started! 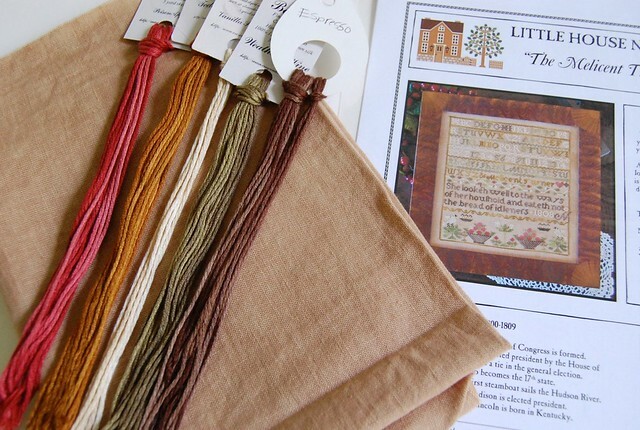 Diane did a great job with the adaption of this sampler and I love the colors she chose! I think I may use Vanilla Pudding instead of Baguette though. The Baguettes I have are all a little dark. The linen I'm thinking of using is 40 ct. WDW Straw. I also finished up block 6 of VoHRH. I would have been done sooner, but I had to do some frogging. I love your stitchy progress and I am so looking forward to your new start on Millicent. The colours look lovely! Block 6's colors are so nice and the stitches are perfect. Thank you for posting the linen colors - it certainly helps those of us that have to order sight unseen. I love both of these. WDW Straw is becoming my favorite linen color! I got a large piece while I was in Indiana and I'm having a hard time using it - LOL! Love the progess you are making - keep us updated!! I haven't picked up Millicent, but she's in the bag waiting for me! When will I get stitching her is the question. Too much love and not enough time. Your Village is coming along nicely - will be finished in no time! Oh, Millicent looks like she's going to be a wonderful sampler to work on. Love those threads and fabric. And great progress on Village. I think that piece is my favorite out of all the HRH series. Block 6 is so pretty! Love the colors for Millicent! Oh pooey. I thought I could pass up on Milicent Turner -- but look at those colors! Yum! Your VoHRH block looks great too! Nice work on Village. 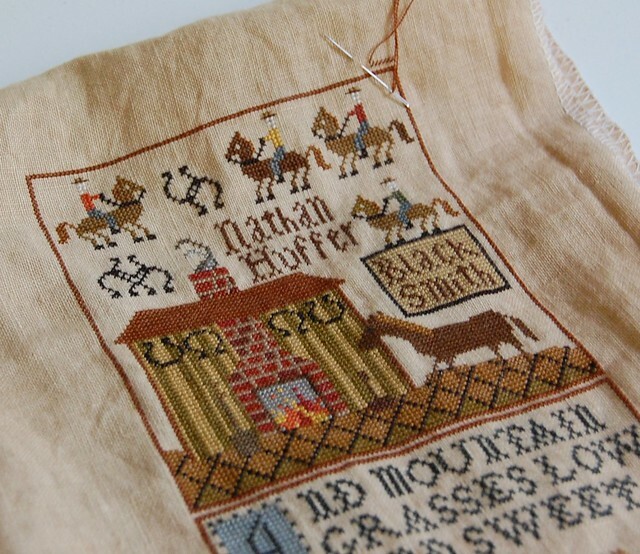 I really like the Little House sampler, too. That LH sampler is so cute! How is your summer alphabet coming? You enabled me...and i need to pull it back out again! I love your block 6. I saw Melicent in the shop the other day, and while I love the colors she chose, I would have preferred the colors of the original--the blues. Look forward to your start on Millicent. Block 6 is gorgeous. Love the colours you have for Melicent. You are really zooming ahead on Village and it looks great. Your new kit looks exciting! Have fun...one stitch at a time! I love WDW Straw..such a great color! The new Millicent pattern just may have to go on my "wishlist". That is really a gorgeous design. The colors are so pretty!! Love your VoHRH!!! And Mellicent is gorgeous isn't she? I have her in my stitching bag too :-). I adore you new pattern and its threads. The VoHRH piece is gorgeous. It makes me want to stitch it too! Glad your stitching Milicent T. and looking forward to seeing your progress pics. Your Block 6 looks wonderful. Congrats on finishing another block. 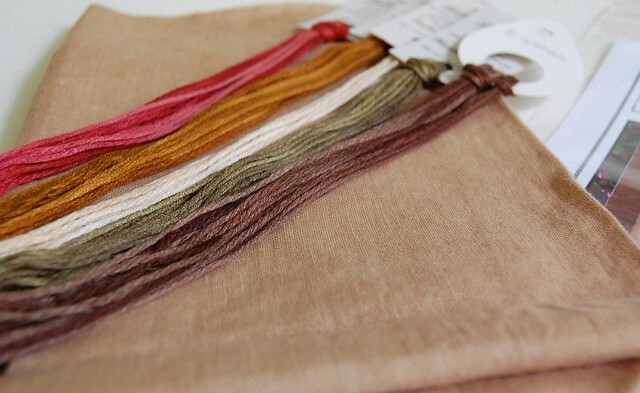 Can't wait to see your new start - the fabric and colors are yummy!! Love that block of VofHRH too!! Gorgeous new pattern. Love your floss toss. It will look lovely. Greetings from a new follower! Congratulations on finishing such a beautiful block. I look forward to seeing progress on your new start. Best wishes. Congrats on finishing another block - it's lovely! Congratulations on finishing up that block! I looooove the colors on Mellicent. I know I'm bungling her name!